by switchgrass (Panicum virgatum), which by January 25th had done a pretty job of drying out. Here’s a closer view of the switchgrass on the other side of the creek. also wore their winter look. Notice the many hanging seed globes. on both sides of the creek had just been cut back to the ground. The switchgrass looks so inviting. We have a couple of sycamore trees on the place here. I love those dangling seed globes. They look like fabulous earrings! This isn’t the first time someone has said that a botanical feature reminds them of earrings. My reply has usually been to suggest that the person try to make a set of such earrings, or to get a jeweler to do it. As far as I know, no one has acted on that. Here’s your chance to craft a pair of sycamore seed ball earrings. With the switchgrass, it was the reflection that particularly got to me. 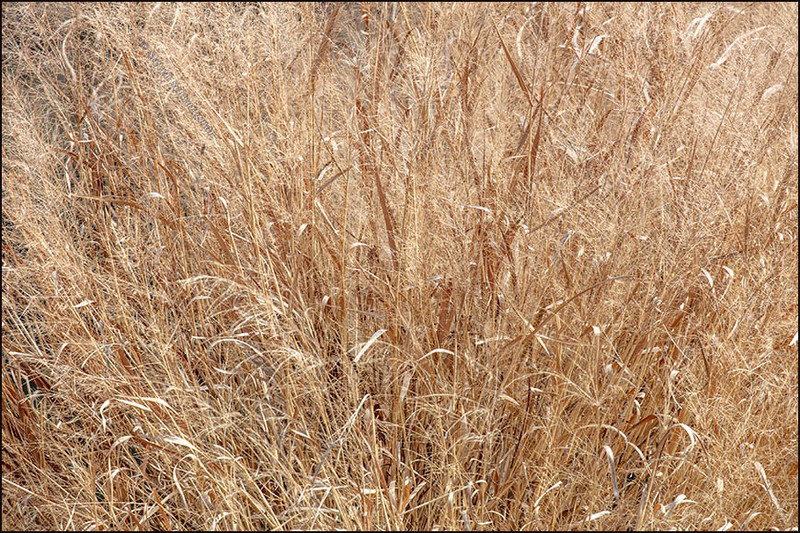 Since I was in junior high, I’ve seen articles touting switchgrass as a source of biofuel, but it always seems to be “promising” and “real soon” rather than real. I guess it has some real advantages over corn as a source of ethanol, so maybe we’ll all be seeing a lot more switchgrass in the future. I’ve also seen (though going back only a small part of the way to high school) reports about switchgrass’s potential as a biofuel. You’re right that it never seems to happen, except that in my case switchgrass has been fueling photographs for years now. Ethanol from corn has been one more government boondoggle. World-wide it’s driven up the price of corn as a food for people, the poorest of whom can least afford the increase. That first image is stunning. Good thing you were able to capture it before the cutting took place. I do always cut my native grasses back in the spring. It feels early to do that but maybe it is about to start greening up down there? I have an acquaintance up here who makes jewelry inspired by nature. One of my favorites was a monarch caterpillar she made out of resin. It was really cool. If I see her again (and remember!) I’ll suggest earrings of sycamore seed balls. Glad you appreciate that first image. I couldn’t resist the reflection, which is the third in a row I’ve shown here. Temperatures here have risen into the 70s this week, accompanying the fresh greenery that has become more and more apparent. That said, the low in the early hours tomorrow is predicted to be 33°. As long as it doesn’t drop any lower, the new plants should be all right. As for sycamore seed ball earrings, it occurred to me just now that their prickliness might make them impractical. That occurred to me as well but they would be lovely dangly ornaments elsewhere. Perhaps a small sculpture of a tree, or on houseplants, or something. By the way, one thing I’ve unfortunately noticed when doing reflection pictures is how much trash has gotten into the water. If it’s just a plastic bottle or small container I can remove it when I process the photograph, but on the walk by Lake Pflugerville the other day one part of the shoreline was littered with so much junk that I couldn’t easily have photographed it if I’d wanted to. Eww to the woman and her baby. When I lived in Honduras it bothered me to see how people routinely threw garbage into the street. We’re better here but there’s still room for improvement. There sure is. I saw a study somewhere that showed if one or two pieces of litter appeared on a street corner, in very short order there would be LOTS of litter there, even if it was an area that ordinarily had no litter at all. It is as though people hold themselves to the standards they see around them…..oh, we’re seeing that in politics, aren’t we? Setting a good example has a long pedigree. I was embarrassed to read that Lake Pf was littered. I reported your comment to the City Parks and Rec department. Hopefully they will follow through. When the weather gets better, I will take a walk over there and bring along a trash bag and a camera. Now that’s being a good citizen. When I saw the litter there I thought cleaning it up would make a project for the Boy Scouts or similar group. Whoever does any thorough cleaning will want to wear rubber boots to wade out to where a lot of the trash was. A small boat might also work. I’ve never seen a sycamore with such artistically placed seed balls. That’s one fine photo. So is the first, for that matter. 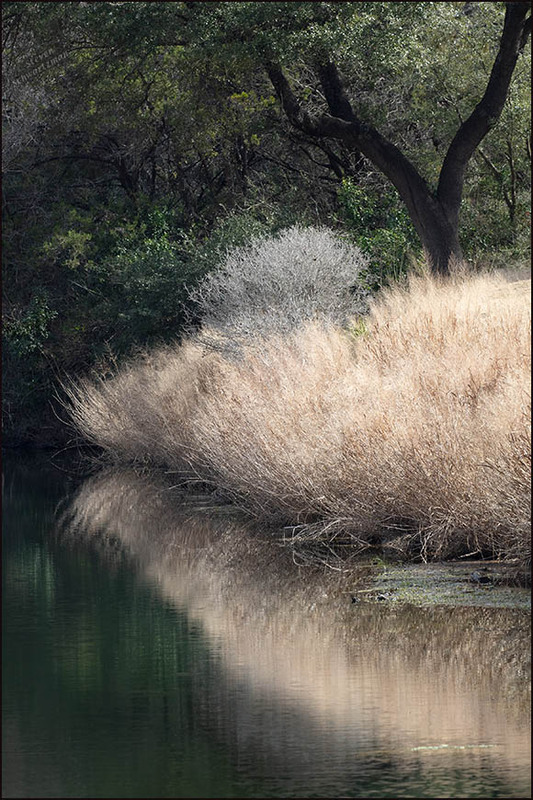 I like the reflection, but I’m just as delighted by the layers of interest: water, switchgrass, gray whatever, and trees. The closeup of the switchgrass confirmed for me that the grass I’ve been trying to identify most assuredly isn’t switchgrass. In the process of nosing around, I serendipitously solved another mystery: the identity of the pretty purple grass found along so many highways. I’d assumed it was native, but it’s not. There’s a good article about a pair of non-native bluestems here. 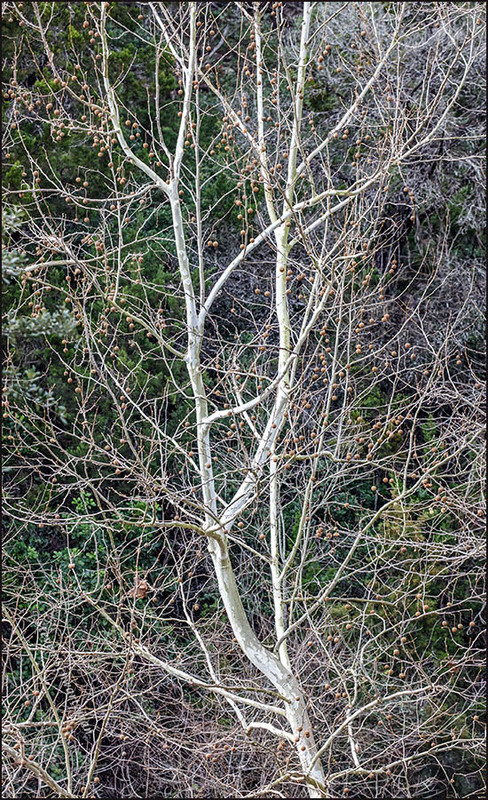 I originally took the sycamore picture for the way its main branches stayed so close together rather than spreading, which seems much more common and which I photographed in an adjacent sycamore. Only back home did I notice how many more seed balls the narrow sycamore had than the spreading one. While in Oklahoma, I noticed a complete lack of big trees. Some of the native sycamores, including some that were planted along a neighbor’s driveway, were quite tall, but none were very big. In fact, none of the trees were very big. It really gave me more of an appreciation for how big trees are here. Some of the native California sycamores here have trunks that are wider than six feet. The native valley oaks are the biggest oaks of North America. The ponderosa pines and Douglas firs seem to be almost as big as redwoods here. But, why I am I telling you all this? If you look to the West, you can see for yourself from there. The Great Plains mostly lack large trees, no question, especially when compared to California. I wish we could see it from here. That said, some people who visit Austin for the first time are surprised to see that we have as many creeks, canyons, and trees as we do. What I remember about Oklahoma is that from the high spots, the horizon looked very flat and uniform. The tall trees lived in the low spots, but grew to the same height as those in the high spots, which make the roof of the whole thing look as flat as it seemed. Yet, there were more creeks and valleys below that were obscured by the roof of trees above. It was weird. Here we have hills that rise up above the flat spots. There, it is flat, with low spots eroded into the flatness. It was fascinating to not be able to see any sorts of mountains or anything on the horizon in any direction. The eroded flatlands you describe characterize two of the most scenic places in the part of Texas west of Oklahoma, Palo Duro Canyon and Caprock Canyons. That region around Amarillo looks quite like where we were in Oklahoma. Actually, the scenery did not change much for hundreds of miles. However, I did not see such deep or steep canyons. Dang, I really could look around the region more. I so miss Oklahoma. You’ve spoken so wistfully of Oklahoma, here and in other comments, that I hope you get a chance to take a long vacation there, perhaps with a side trip to the two canyons I mentioned in the Texas Panhandle. Oh, I SO intend to return to Oklahoma, and take my time to see what is between here and there. I did not do that last time. Utah, Arizona, and northern New Mexico have great scenery. Yes, I particularly like Arizona, just like I expected to. I have not seen Utah yet. I first saw Utah from a plane when flying to California and was so taken with what I saw below that I went back by car a couple of years later to explore it up close. Utah has five national parks and many other great sites. One thing that I learned in the little bit of traveling that I have done, is that I need to decide what I want to see, and believe in my own best judgement, rather than rely on what others tell me. When I went to Oklahoma, I was warned about how boring the drive would be. The ‘worst’ parts were what I found to be most interesting. I intend to eventually go to Utah, as well as eastern Nevada, just beccause I find them compelling. Eastern Nevada is really one of those places that I never hear about because no one has a reason to go there. While I enjoy all three images, that first one with the nicely lit Switchgrass really grabbed my attention. That’s what grabbed my attention when I happened to drive past there on my way home on January 25th. A little later in the day I went back out with my camera equipment to see what I could record. My main difficulty was that the golf course is private property so I couldn’t wander where I wanted but had to do the best I could shooting from the road with a telephoto. And that brought me to the second difficulty of manmade structures visible in the background, which I managed to avoid only from a few restrictive positions. Yes, it was the reflection that grabbed me. I was sorry not to find any more reflection when I went back, but at least I have my pictures.